Maldives is in the bucket list of many backpackers here in the Philippines. Maldives, famous for its luxurious resort islands, crystal clear waters and abundant tropical reefs, may seem such a luxury to get lost into. We discovered that this is not the case. In fact, you just need P30,000 or less. Here’s a detailed Maldives budget travel guide to help you slash it off your bucket list! Maldives is an archipelago, just like the Philippines, located in the middle of the Indian Ocean. 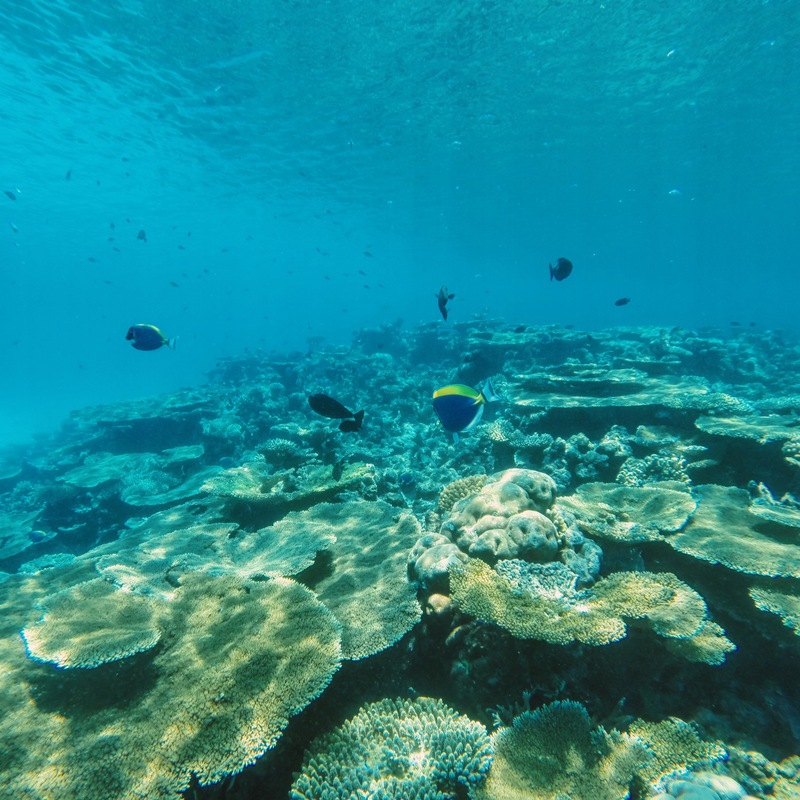 It is made up of 19 atolls (coral reef enclosing a lagoon or group of islands) with over 1,190, mostly-uninhabited coral islands – more than a hundred are resort islands and the rest are local islands. Male, the country’s capital, is located in North Male Atoll (Kaafu Atoll). Most visitors enter the country through Ibrahim Nasir International Airport located in Hulhule Island – a 10-minute ferry ride from Male Island. The peak season is November through April with lean months from May to October where prices are relatively lower. During June and July, the country experiences monsoon rains. The country practices Sunni Islam so respecting their traditions and social customs is a must. When you are visiting local islands, especially the capital, make sure you are covered. For men, you may wear shirt and shorts. For the ladies, wearing a bikini is not allowed in public; wearing shirt and shorts that covers the thigh is recommended. Do not worry, local islands in Maldives have designated tourist beaches where you could strip down to your bikinis. They are not strict on the footwear. Selling and consumption of alcoholic beverages are only allowed in resort islands. Bringing in of alcoholic beverages is strictly forbidden. The currency of Maldives is Rf or the Maldivian Rufiyaa (1 US$ = Rf 15 = P 45). US$ is widely accepted in restaurants, souvenir shops, local transport, accommodation and excursions. We recommend paying your local transportation in Rf and paying excursions in US$. For local transportation, they usually round-up when you are paying in US$ so it’s best to convert some of your budget to Rf to pay for your commute. 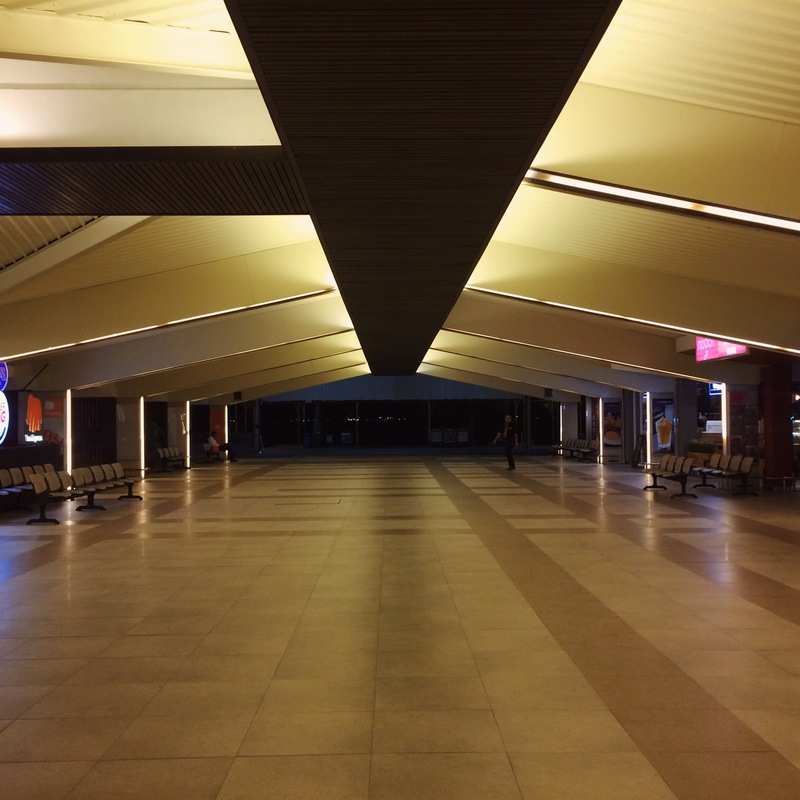 There are no direct flights from Manila to Male, but connecting through Singapore or Kuala Lumpur is an affordable option. You may book TigerAir‘s Manila-Singapore-Male route or AirAsia‘s Manila-Kuala Lumpur-Male route. Singapore/Kuala Lumpur to Male takes around 4 hours and 15 minutes. Another cheap option is to book flights separately. We booked our Manila-Singapore flight through JetStar‘s seat sale promo (PhP 3,500 one way), our Singapore-Male-Singapore flight via TigerAir (PhP 11,000 round trip), and our Singapore-Manila flight using our GetGo points during a sale. For Filipinos, no prior visa arrangements is required when visiting Maldives. Upon arrival, a 30-day tourist visa is issued to travelers with valid documents like flight itineraries and hotel booking confirmation. Upon clearing immigration and exiting the arrival area, head right. You will see a booth for ferry tickets going to Male. Local ferry to Male costs Rf10 or $1. Boat ride is 10 minutes. Upon arriving at Male island, take a taxi to Villingili Ferry Terminal. Travel time is 20 minutes. Taxi ride costs Rf25 per stop, regardless of number of passengers. At Villingili Ferry Terminal, buy tickets to Maafushi Island (Kaafu Atoll). Travel time is 1 hour and 45 minutes. Male – Maafushi ferry leaves at 10am and 3pm daily except Fridays. Speedboat Option: If you have money to spare, at the airport (Hulhule Island), you may already take a direct speedboat to Maafushi Island. It will cost you US$ 20-50 and the travel time direct to Maafushi is only 30-40 minutes.You may coordinate with tour booths outside the arrival area. 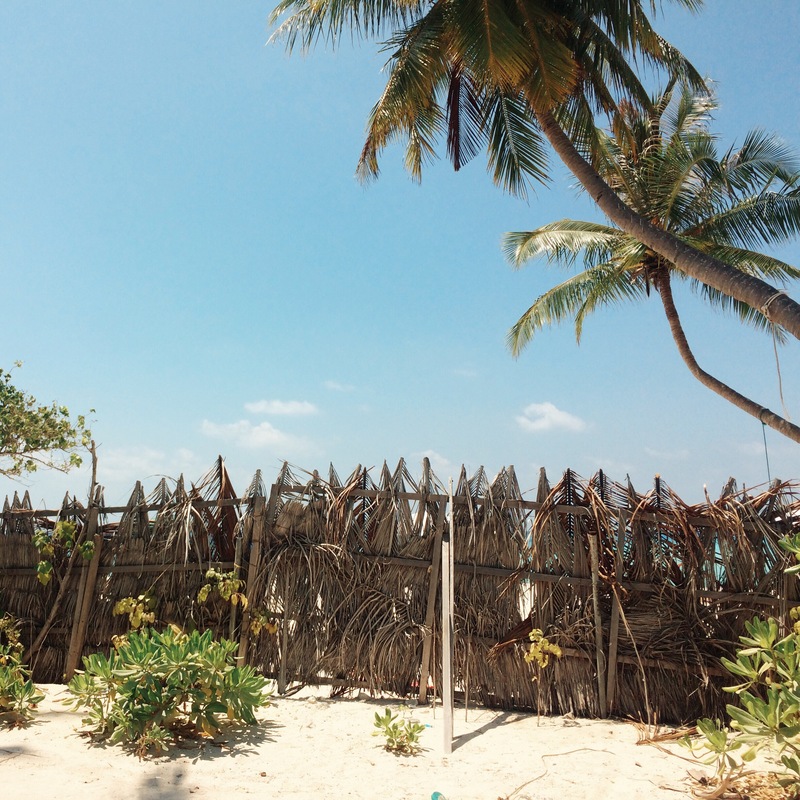 In 2009, the government of Maldives allowed the building of guest houses on local islands to make income distribution more even. This opened the country up to budget travelers. Most guest houses in Maafushi are owned by locals. Before that year, tourists may only stay on expensive resort islands via private speedboat rides or seaplanes. We recommend Maafushi Island if you’re a budget traveler because it’s accessible from the capital and there’s a great number of guest houses and restaurants. It has the most number of guest houses among all local islands in the country. Don’t be scared of booking inns within the side streets because you really do not need a beach front accommodation in Maafushi. A prison takes up one end of the island. There’s a tourist beach next to the docking area and a public beach on the opposite side of the island. There’s a good selection of restaurants in Maafushi. 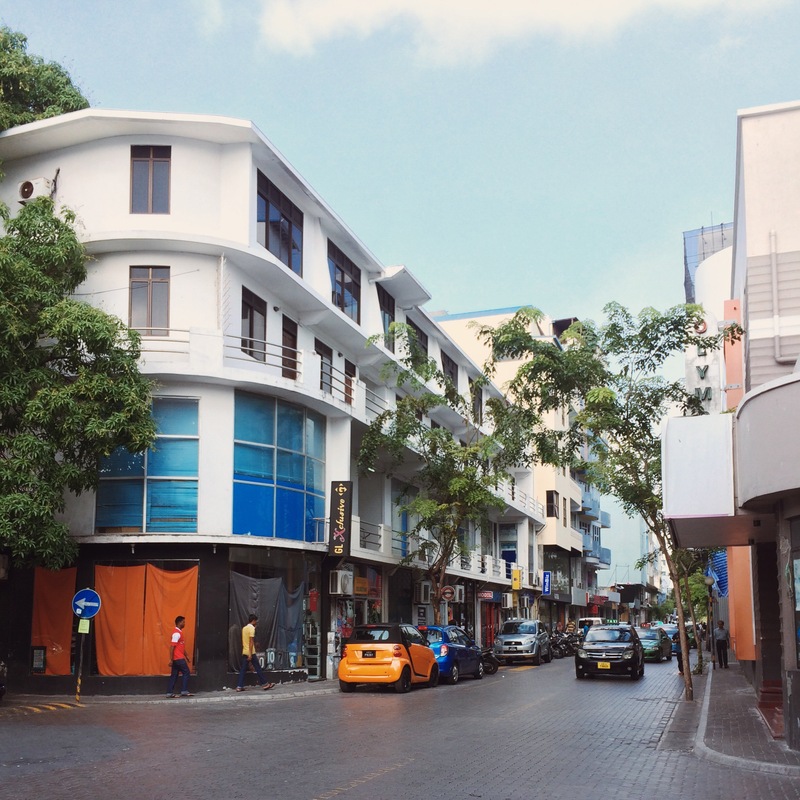 There are also supermarkets, souvenir shops, booths for water activities and excursions, a pharmacy, hospital and an ATM (Bank of Maldives). 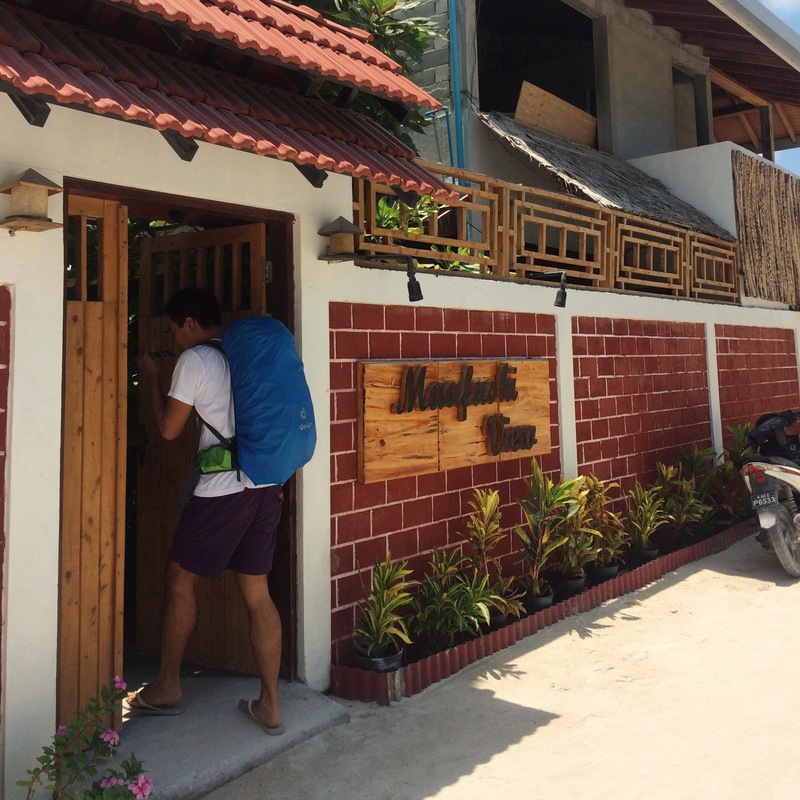 We booked our accommodation through Airbnb and stayed at Maafushi View Inn. Most guesthouse rates already includes daily buffet breakfast, air-conditioned rooms, towels, basic toiletries and a decent WiFi. Make sure that the inn is located in Maafushi Island before booking. We also used our P2500 Airbnb discount voucher from Smart (Update: it’s now P1,200 discount for every P4,500). You may also check out Maafushi View Inn’s Agoda rates and availability here. To compare prices you may also check out Booking.com’s list of hotels. Public ferry from Maafushi to Male leaves at 7am daily except Fridays. Confirm this with your hotel/guesthouse upon arrival. You must purchase tickets beforehand at “Aachaa” shop, a grocery store in the island, preferably 1-2 days before your planned departure. You won’t run out of things to do in Maldives. Snorkeling is a great activity. On top of that, you may also visit dolphin, whale shark, manta ray and shark points. Day-trip to different resort islands can also be arranged from Maafushi. You may also spend the day in neighboring islands where you could have lunch and swim for the whole day. Remember to scout for the best price and not just settle for the package offered by your hotel or guest house. Most of these excursions are whole day activities which include lunch; while some are half-day excursions only. You may also do water activities like kayaking, parasailing, water tubing, jet-ski, wake-boarding and a lot more! A 5-day trip is enough to explore Kaafu Atoll where Maafushi Island is located. You may choose an excursion per day. 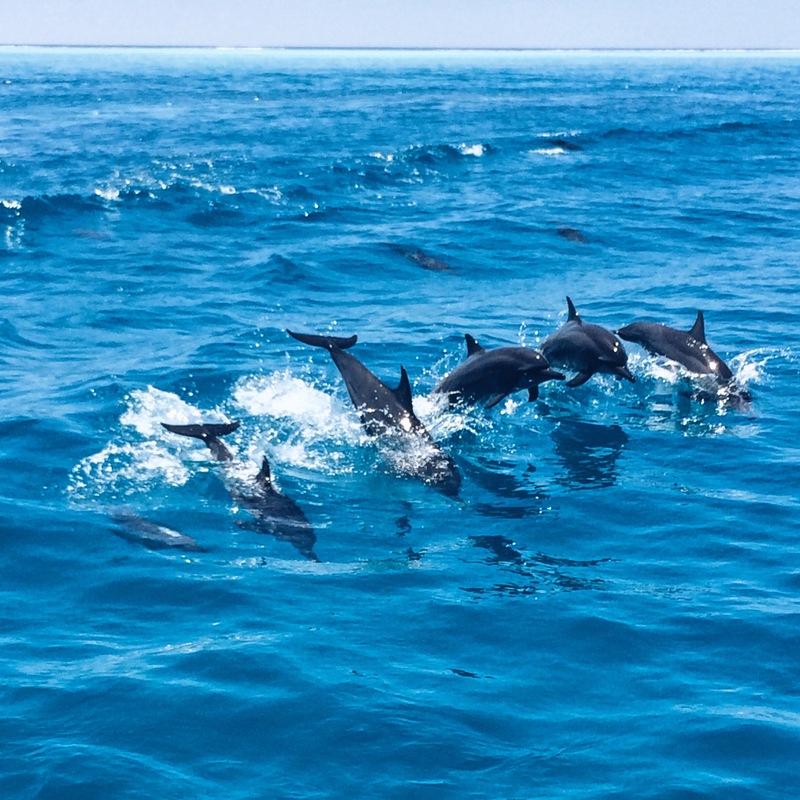 We recommend going to Dolphin Point, reef snorkeling, visiting a resort island and sandbank excursions. Here’s a breakdown on how you could visit this paradise with only P 30,000. Save on airfare and check out promo fares. Check out budget airlines like Cebu Pacific and JetStar to Singapore. From Singapore you may get a TigerAir flight. Avail of loyalty programs like GetGo to get cheaper or free flights. Check Airbnb for accommodations for more affordable rates. We were surprised that the posted rates of Maafushi View Inn is cheaper in Airbnb. We also got a 2,500 discount because of AirBnb’s partnership with Smart (Update: it’s now P1,200 discount for every P4,500). You may also check out Maafushi View Inn’s Agoda rates and availability here. Take the public ferry instead of private speedboat rides. While the public ferry ride (1 hour and 45 minutes) is thrice longer than the speedboat ride (30 minutes), the former ($1) only costs a fraction of the latter ($25-50). Meals – staying in Maafushi Island with a number of restaurants is an advantage because you have cheaper options. Confirm if your accommodation has free breakfast. Most excursions include lunch as well. We spent $3-8/dinner in Maafushi Island. For excursions, remember to scout for packages. Usually small inns offer cheaper excursion packages than big hotels. Ask what they have to offer. Most of these excursions include lunch already. That’s one less meal to spend on! You may let-go of visiting resort islands since it is expensive (at least $75). 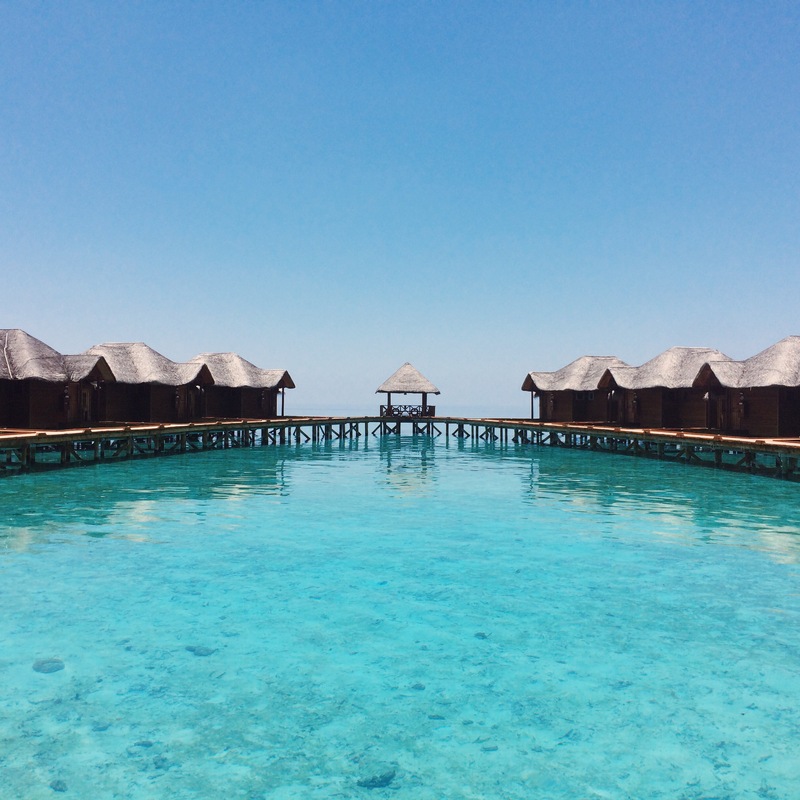 But we still recommend it since Maldives is known for its water villas. Explore Maafushi Island. The tourist beach in Maafushi is stunning. Watch the sunset from there. Some hotels and guest houses have bikes free of charge. Biking from one end of Maafushi to another takes only 5 minutes. Don’t forget to request for free water from your hotel or guesthouse. They do not normally give service water in Maafushi even in restaurants. A big bottle of drinking water is around 15 Rf (US$ 1). We’ll help you slash it off your bucket list – Comment your questions below! Hi Guys. this is very helpful indeed! Planning to use your itinerary for my travel to Maldives this April! May I know where did you book your ticket for the excursion? And how much is the visa? Thank you! hello just want to know if you book your snorkeling or activities upon arrival in the inn your staying or you have to book it in advance ? Thank you. Very informative. Do I need to present a bank statement for the visa or do I need the (US$100 + $50 dollars per day) onhand? I am planning to visit Maldives this coming May 26. Is Php 30K budget still be possible for a solo traveler? I would definitely use your sample itinerary as my reference. Beautiful and awesome article about Maldives. Some of the photos are so beautiful, sunset one is my favorite. From the pictures I can say you enjoyed the vacation to the fullest. Cheers. Keep good things coming.